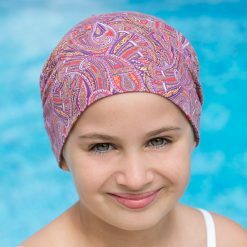 I designed the chemo headscarf to flatter every face. It is cut in 3 panels which gives extra height above the face. I find most of my ladies turn back the front panel to give more height but it can also be pushed back flat to give more of a bandanna type effect. It has a small elasticated section at the back but also has a flattering tie – belt & braces! This is the style for anyone who wants to wear a pretty headscarf but doesn’t want to have the hassle of learning to tie a square one, and it is completely secure on your head, alleviating the worry that a regular headscarf might slip or blow away. It looks great worn under a straw hat in the summer and the ties at the back create an illusion of hair. This style can be put on and tied in seconds and can be taken on & off already tied if you are post operative & raising your hands to fiddle with headscarves isn’t so easy. It is the ultimate easy tie headscarf for anyone undergoing chemo or suffering from alopecia or any other female medical hair loss issues. I have been approached by several mothers wanting something pretty yet practical for their daughters to wear whilst enduring the rigours of chemotherapy. 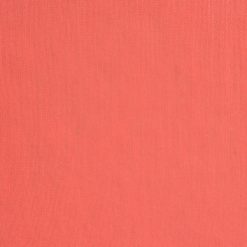 I even had a request to source a cute Liberty fabric to work with a red & grey school uniform. 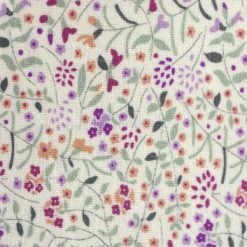 I now offer my Kitty Beanie hat & Liberty Alice easy tie headscarf styles in a gorgeous selection of Liberty of London fabrics I have simply called them Little Kitty & Little Alice. If you have any specific requirements please contact me directly by phone on 01798 861501 or via email: claire@chemoheadwear.co.uk to discuss. 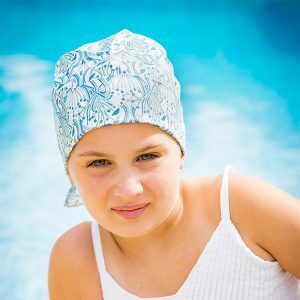 The Little Kitty is a clever little cancer hat that was originally designed as a sleep cap for anyone suffering from female hair loss, whether it be due to chemotherapy treatment, alopecia or other medical female hair loss issues. The simple fold back design makes it comfortable to wear at night with no seams digging into you while you are sleeping. I then thought it was a bit of a shame to have something you only wore to bed so I designed this so that it can also be worn unfolded and scrunched down to create a casual ruched effect – taking you from pyjamas to jeans in seconds. It consists of a fold back panel, a narrower band & a circular crown. It can also be worn a third way as a trendy beanie hat sitting snug around your face and then falling back in a slouchy way at the back. The simplicity & diversity of this style seems to be universally liked and it has quickly turned into my best selling jersey (stretchy) style. 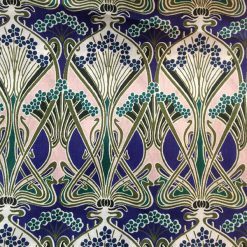 I have wonderful selection of ever changing beautiful Liberty of London prints. The drape & quality of the Liberty viscose jersey is second to none and I hope that there should be a print for everyone there, whether you have blue, green or brown eyes.